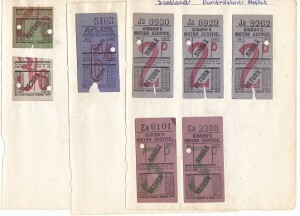 8 bus tickets of Gibson’s Motor Service and the Blue Band Bus Service of Moffat and Lockerbie. These were collected in the period 1958-1959 and pasted onto a page of an album. £20.00 including postage within the UK.